Animal science graduate Lukas Robertson attempted to make an “impromptu speech” during the College of Agriculture, Food and Environmental Sciences and College of Science and Mathematics commencement ceremony June 16. 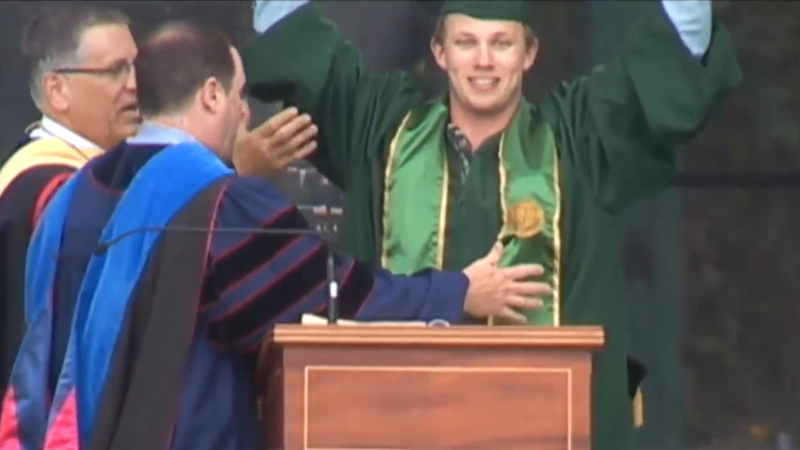 Robertson got on stage just after Associated Students, Inc. President Riley Nilsen addressed 1,500 graduates in Alex G. Spanos Stadium. Vice President of Student Affairs Keith Humphrey, President Jeffrey Armstrong and Dean of Students Kathleen McMahon initially tried to hold Robertson back and pulled the microphone away. He shouted, “Let me make a speech,” as the crowd erupted in applause. It took nearly a minute before two University Police Department officers arrived and escorted Robertson off stage. Robertson was arrested on a charge of being drunk in public and was booked into San Luis Obispo County Jail.